Supports plantar fasciitis and achilles tendonitis. Is the Airheel Arch & Heel Brace right for me? Designed to support Plantar Fasciitis and Achilles tendonitis. May be worn during activity. Try our Brace Advisor for personalized product recommendations to meet your needs! The Aircast AirHeel™ brace supports plantar fasciitis and achilles tendonitis by applying pulsating compression with every step, which helps reduce swelling and enhance circulation. The AirHeel brace is ideal for all activity levels. Constructed of lightweight breathable fabric, the AirHeel brace is simple to apply - just slip it on like a sock and adjust the fit with one strap. Here's how it works...The AirHeel™ brace is equipped with two interconnected aircells located under the foot arch and in back of the achilles tendon. When you take a step, the first air chamber (under the arch) begins to collapse thus reducing the stress to the plantar fascia under the arch. Air is forced into the chamber surrounding the achilles tendon which then inflates. The inflated achilles chamber applies compression to the achilles tendon to shorten the lever arm thus reducing strain on the tendon. You'll feel like your foot is getting a massage with every step due to the pulsating pneumatic compression that minimizes swelling and enhances circulation. Lightweight and breathable materials makes this brace extremely comfortable to wear with a shoe. Optional removable stabilizers that contain 2 small plastic stays in the sides of the ankle for added ankle support (not necessary for plantar fasciitis). Made of a latex-free, compression spandex with air cells encased in waterproof nylon and adhered together with a Velcro strap. Easily fits in shoes and can be worn in all activities. Click on the Size Chart tab above to learn how to measure your foot to determine what brace size you need. i have planter and flat arch in my left foot wanted to know if i should get the product for both feet? cause i feel that way it would support and keep both my legs aligned? and also wanted to know would this product fit in my existing shoe size which is a 9, or should i buy a bigger size shoe? and since i have both plantar and flat foot, this product will give me arch support also? If both of your feet are hurting, then yes, you should get them for both feet. Otherwise just the affected foot. The brace should fit in your normal size of shoe. I work on my feet for 8+ hours a day, sometimes never getting the chance to sit. I have developed somewhat severe plantar fasciitis and have heel spurs. Will this help me out? The Aircast Airheel Arch and Heel Brace will assist with the Plantar Fasciitis due to the air cell begins to collapse as you take a step, reducing the stress to the plantar fascia under the arch. Is the air puff ball like inside called the stabilizer? Or is the stabilizer a metal rod. The optional removable stabilizers that contain 2 small plastic stays in the sides of the ankle for added ankle support. These stays prevent the ankle from rolling. I have been diagnosed with tarsal tunnel in both ankles and slight nerve damage in my left ankle. Would this brace provide the support I need to run again and begin training for long distance running? My 9 year old plays sports and is very active. She was just told by the pediatrician that she has Aquilies tendinitis. We are doing the exceecises by the dr and she is wearing heel cups in her cleats. She is still in pain. Would this be something that a 9 year old would benefit from? She is a shoe size 4/5 so I'm not sure if they come in child sizes? Thank! Your reviews were excellent so I am eager to hear your response. My shoe size is right at 8.5 (Womens size) some shoes I buy are size 9. What size do you recommend? If the majority of your shoes are 8.5 we would suggest the small Aircast Airheel Arch & Heel Support. The spandex expands so it will stretch to accommodate your foot. Im a stay at home mom so im around the house 24/7, can i wear the brace around the house with no shoes and it still be benificial? I have recently sprained my ankle and usually I can walk on it without any pain within 4 days. This current sprain has lasted 11 days and I can barely walk on it, probably the worst sprained ankle I've had... and I've had about 3 on this ankle. Would this product be recommended for this? I plan on using it for daily use. 2 questions. I am debating between getting a small or medium. I wear womens 8-8.5 wide. I am also a long distance runner & would I be able to wear it in my sneakers for running? I broke my heel bone in the middle of December 2015. Lucky for me no surgery was needed just a soft cast no weight on my foot for 3 weeks then a walking cast with minimal weight for 4/5 weeks. My heel still experiences some pain when walking in flat soled shoes for short distances and walking over a mile in sneakers. Will this product be my best chance to get back to moderate workouts (jogging and spin)? I am recovering from foot surgery(Oct1) they repaired the Achilles tendon and removed a heel spur.I stiil have a heel spur on the bottom of my right foot(the surgery foot) I'm on my feet 8hrs a day on concrete floors Would the Aircast air heel be beneficial to use? I want to avoid more surgeries. Yes the Aircast air Heel will cushion the heel while you are on your feet and should alleviate some of your pain. HI i was wondering If this brace was good i am a horseback rider and i am always having my heals down and would it fit in a riding boot and be good for riding. thanks and also is it returnable. I have severe tendonosis in my Achilles tendon. Would this product help that situation? This brace could be some benefit to you. The air cushion in the heel is compressed with every step and the air moves into the Achilles area to provide compression which can help decrease pain. I am recovering from a fractured fifth metatarsal and going from an aircast to a sneaker .. Would this help support the foot? The Airheel can be used to help with plantar fasciitis, achilles tendonitis, and heel pain. Please call us with any additional questions. My 12 year old daughtet dances ballet on pointe 5 days a week. She has developed achilles tendonitis. Is your product appropriate for wearing in pointe shoes? Can this help her? I usually wear a size 11 shoe but I have wide feet and ankles should I order a M or L? Can I wear air cast to sleep? How much does one of these weigh without the ankle support insertion? I have been diagnosed with tenosynovitis and told to tape. The tape is ripping the skin off of my foot. Any suggestions? Will the aircast air heel work with or without being taped? I am wondering if the small pump device that is sold to pump air into the larger boots will also work for these airheel support braces. How do I know whether I should order this brace with or without stabilizers? I have Achilles tendinitis, retrocalcaneal bursitis, and longitudinal split tear of the peroneus brevis. I am looking for a brace I can wear with my shoes to help with these ailments. From your product selection would this be the best fit? The Airheel will help decrease pain associated with the Achillies tendonitis and bursitis because of the air cusions in the heel and in the back of the brace. the stabilizers in the brace will proved mild stability of the ankle . I just received this brace. Should I wear it all the time to start, or should I start off slowly with only a few minutes (or hours) at a time? I am a gymnast and I was wondering if the air cells would pop if I jumped on the brace. I would be landing on it hard, but I only weight 85 pounds. I would be using it everyday. Are the stabilizers removable? Do the stabilizers keep the ankle from bending? I wear a size 9 shoe but have a narrow foot. Would the small be a better fit for me? Also, what does with stabilizers consist of? My 11 year old son is a gymnast. Are the closures on this product strong enough for barefoot tumbling on a spring floor and for sprint running on a vault runway? Also, is the arch support/cushion positioned toward the inside of the cast? In the photo it looks like it is also along the outside edge which would defeat the purpose of wearing it for him. The Airheel is not an arch support, it is for plantar fascitis and heel pain, so the air bladder is over the heel of the brace. It will withstand running and tumbling. 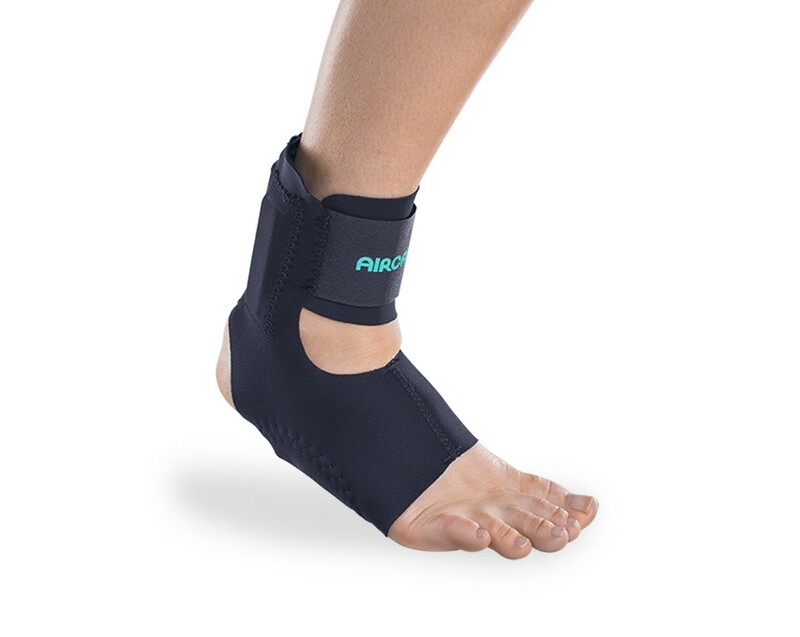 The Airsport PTTD Brace is an arch support and the air bladder is along the arch of the foot. This brace also has two plstic stays anlong either side of the ankle. There is only a small strap going across the back of the brace at eh achillies area. This brace is for ankle support and arch support. Depending on manufacturer, my shoe size is 11, 11.5 or 12. Should I go with medium or large? I would suggest the large. If I plan to jog using the aircast, should I get one for each foot? I only have pain in my right foot. I have plantar fasciitis, loose ligaments, tight tendons, a neuroma, and a metatarsal that is too long in both feet. I sprained both ankles and fractured my leg a few years ago and these are the results of that accident. I need something for the plantar fasciitis and that supports my ankles since they tend to turn under while I walk/workout. Would this be the support that I am looking for? What is the difference between the Aircast Airheel Ankle Brace with stabilizer and the one without the stabilizer? Do I need one with a stabilizer for Planter Fasciitis? Thank you for your question. The Aircast Airheel Ankle Brace with stabilizer will contain 2 small plastic stays in the sides of the ankle to provide an additional support to the ankle joint. This is not a necessary feature for plantar Fasciitis. Over the last 2 years I've badly strained both my achilles tendons without any tearing playing softball. Is the Aircast Airheel Ankle Cast the right product for me to wear while playing for prevention of future strains of my achilles tendons? If I wear one on each foot, will this restrict my speed while running the bases? I was diagnosed with PTT a couple years ago and my foot has never fully healed. It has started acting up really bad again. I have a very high arch (def not flat footed!!!). I am not sure which brace to go with. What would you recommend? Thank you! Thank you for your question. We offer a brace designed for PTTD called Aircast Airlift PTTD Brace. The AirLift PTTD Brace is designed for the treatment of posterior tibial tendon dysfunction (PTTD), or for early signs and symptoms of the adult acquired flat foot. Since it can be use for either PTTD or Flat foot, this is the brace that would be recommended for you. Hi, I have flat feet and suffer from plantar fasciitis . I play beach volleyball twice a week and my fascia contracts if I'm not constantly stretching it during game. I was wondering if the airheel could be worn during the game? also is the fit loose or tight on the foot? I ruptured my Achilles tendon about 18 months ago. I exercise, but still have some soreness during and after workouts. Will this product help support and soreness while working out? Thank you for contacting product support. The Airheel will help with soreness during a workout because it is a air cushion over the back of you heel area where the Achilles attaches. It does not however offer any ankle support. I'm eight weeks into recovery from a Plantar fasciotomy with Heel spur removal. Will the Airheel Aircast help with some of the left over pain that I feel when I walk. Every time I take a step there is still some pain as I'm putting wait on the incision scar. The aircell may add some cushion and shift some of the weight from your heel. There will still be some pressure on your incision as this brace will not keep the area free of "weight bearing". Thank you for your question. I have insertional achilles tendinosis and experience pain in the back of the heel when i push off of or land on the ball of my foot during running and jumping. Will the AirHeel relieve pain for this particular type of achilles tendinopathy? Thank you for contacting product support. The Aircast Airheel should help ease some of your pain. The airbladders are located on the arch and on the back of the brace over the Achillies tendon. When you step down the air in the arch pushes into the back aircell to hit your heel and achillies. Do you recommend this product for people with diabetes? I will be returning to work after <a href="/ankle-injuries/achilles-tendonitis">Achilles' tendon</a> surgical repair, will this air cast provide support for my achilles, I spend a lot of time on my feet.? The Airheel gives some relief for the Achilles Tendon, but is not recommended post Achilles surgery. I would ask your physician what he would like you wearing. What kind of warranty does the Air Cast have? I had bought a pair for both feet and the A-C lost it inflation after one month. The AirCast has a 6 month warranty. Can I wear aircast ankle brace without shoes? Will it get damaged? What about wearing them with sandals? The aircast ankle brace is not recommended to be worn without shoes. It is recommended to be worn inside of a shoe. Can I run with the air cast on? Yes you can run with the Aircast Airheel Ankle Brace on. We recommend that you speak with your doctor first to make sure that he/she has cleared you for running-type of activities. My foot pain is gotten so bad that I can barely walk. I have custom made inserts that aren't doing a thing and I need to know the best product to treat my PF? I am ready to pay what I need to even have them shipped overnight. In some of your splits I don't see a lot of arch support. I need something to wear all day/night. Please tell me which is the best splint/boot for extreme PF. The Aircast Airheel is a good product to use while walking or ambulating. However, for nighttime use, we recommend the ProCare Dorsiwedge NIght Splint. If you would like to get the Aircast AirHeel/DNS Care Kit, that would include the combination of the AirHeel brace and night splint. Can the brace be worn inside <a href="/volleyball">volleyball</a> shoes as well as the volleyball ankle guards? The airheel is made of neoprene, it is not very thick, but wearing it with an ankle brace for volleyball may make it too think to wear in your volleyball shoes. Will the airheel cast alleviate arch pain? Will it offer any arch support while walking it standing? Thank you for contacting DJO Global. The Aircast AirHeel brace treats plantar fasciitis, achilles tendonitis, and heel pain by applying pulsating compression with every step, which helps reduce swelling and enhance circulation. The AirHeel brace is ideal for all activity levels. Constructed of lightweight breathable fabric, the AirHeel brace is simple to apply - just slip it on like a sock and adjust the fit with one strap. In therory, because it alleviates Platar Fasciitis you should have reduced arch pain. I should order a medium based on shoe size. However, I need to know how big around the upper support strap will accommodate. People have asked already, but the answer just points to shoe length size, and that doesn't help. How big around is the upper lower leg strap? Is it the same size for all shoe sizes? I have PTTD and the PTTD brace is so uncomfortable I cannot stand it. But the bottom air in the foot does give me some relief and lifts my foot up some. I just cannot take anything against my ankle. Would this aircast airheel ankle brace help me. The AirCast Air Heel does have an aircell on the arch and on the Achilles Tendon, however; it does not provide ankle stability. So depending on what you are looking for, this could be an option for you. The AirHeel will provide achilles support while wearing a boot or a shoe. Based on your size, you should order a medium. I am a cashier/sales associate with plantar fasciitis. Would the Aircast Airheel Ankle brace be a good fit for me? Also, is the brace Latex Free? The brace is latex free, and it will be a great option for your plantar fascitis. Especially cause you are up on your feet all day, this will help support and massage that area. Will help with a neuroma? It depends on where the neuroma is. Normally the are up at the toes, and this aircell sits in the arch of your food and provides support there. So if it is at your toes, it will not probide you with the ultimate support needed. I am a dancer, I have been told by doctors that there is nothing they can do for my pain. They said it was probalby tendonitis. It hurts most around the achilles tendon. I am at a dead end and need help. I would say my pain is moderate to severe, will this brace help me? also, is the brace flexible enought to dance in(i have to point my toes!)? lastly, my last aircast was pre-inflated, but seemed to loose the air over time...what should i do about this? The Aircast Airheel Ankle Brace is meant to be worn with a shoe, will you be dancing with a shoe on? If so, it would work. The aircells are inflated. There is a 6 month warranty. If the aircell deflates during that time, please contact us so we can swap it out for you. I have a swollen achilles tendon in my right ankle. I get cramps in my right foot from alot of stop and go driving, will this brace help me. Thank you Tom M.
Yes the Aircast Airheel Ankle Brace would be recommended for someone like you with a swollen achilles tendon. The dual aircell technology will help to compression your achilles to press the swelling out of that area alleviating pressure and pain. Should you have any additional questions please contact us again. I don't know what is wrong with my achilles tendon but I have pain there. Does the Aircast Airheel help other achilles tendon pain or just achilles tendonitis? The Aircast Airheel has two aircells in it, one under the foot and one on the achilles. The air pulses back and forth creating a massaging affect which loosens up the tissue. If your Achilles pain comes from chronic tightness then yes, the airheel will help. If your achilles pain comes from something else(for instance over-pronation, ankle mal-alignment, Ligament laxity, etc) then no, the Airheel will not help. Does the aircast airheel provide arch support when sitting or lying down? The Aircast Airheel does not provide any arch support. The Airheel is for people who have Plantar Fasciitis and/or Achilles Tendonitis. The Aircell under the foot does not support the arch. Can I wear the air heel along with orthotics? Yes you may wear the AirCast airheel with your custom orthotics. Does the width of the foot impact what size I should order? I am a womens 10 but I wear the widest shoe. Karen, the foot section of the AirCast Air Heel is made out of neoprene so it is forgiving and stretches out, therefore it should strech to your foot width. Based on your shoe size you would fit into a size medium which is part number 09AM. Should you have any additional questions please do not hesitate to contact www.betterbraces.com again. I went to my podiatrist and it turns out I have Peroneal tendon tendonitis and a bit of plantar fasciitis. Will the Aircast Airheel help me to heal versus a full Aircast boot? About 6 years ago I had achillis tendonitis and plantar fasciitis and the full boot did the trick along with the night splint. I would like to avoid the full boot if possible. Is a neoprene sock helpful also? The Airheel is great at providing comfort and massaging relief for the plantar fasciitis and the Achilles tendon areas. The Peroneals do run along the side of the Achilles tendon area so it will get some massaging relief as well. As far as the airheel healing the problem, it cannot heal it on its own, but it can provide some relief and massaging to the area while you are active during the day. I suggest you check with your podiatrist to see if the tendonitis is as severe as before, when he had you immobilize the area. If it is not as severe, then using the airheel will help in providing you relief and massage the area while it is healing. We also have a Dorsal night splint that you can combine with the airheel. When wear it at night, it will put your foot in a flexed position that will give the plantar fasciitis, Achilles and peroneals a gentle stretch, which is prove to help in relieving discomfort in these areas. I have severe plantar fasciitis and have tried numerous arch supports with limited success. I weigh 450 pounds. Will your product stand up to my weight? The Airheel is tested to 1000 lbs of pressure. Walking adds 2-3x your body weight to ground forces; so, the product does have a good chance of holding up for you. If I suffer from <a href="/ankle-injuries/achilles-tendonitis">achilles tendonitis</a>, is it better to immobilize the foot completely or will the aircast air heel really work? I also wear a size women's 5, will the small be too big? You should consult your physician to verify the brace style that they'd like you to wear. A size small Aircast Airheel will accommodate up to an 8.5 womens. Will it fit inside a soccer boot or <a href="/running">running shoe</a>? Yes, The Aircast Airheel has a low profile design so it fits comfortably inside athletic shoes. My MRI showed more than one tear in my achilles. After wearing a boot for one month, it got better but never went away. Looking on line, I bought the Aircast Arch support. After just 2 weeks, my pain is 85% gone. Thanks for this product. Great product, great price and it really works. After dealing with plantar fasciitis for over 2 years and trying everything from injections, acupuncture, physical therapy, night boot, orthotics, etc. nothing had worked. A friend recommend the aircast airheel and after wearing it for 2 weeks my foot feels almost like new. Great product, well made and bottom line, it really works. cortisone shots (which I declined). I bought an Aircast Air Heel. Within two weeks I was healed! No pain at all. Great product. I just ordered three more so I can keep one in my motorcoach and different homes. This brace didn't alleviate the pain in my Achilles. The level of support is not what I am needing. The cut of the brace actually rubbed an already tender tendon. My mother-in-law was told by her doctor that she needed to wear a medical boot for her heel spur. While it helped the heel spur, it made her hips hurt from walking unevenly, not to mention that her balance was thrown way off. So I bought her the Aircast Airheel and she just sent this text message to me while she was out shopping: "I am very happy with how my foot is better using the ankle brace you sent me. All this walking and I'm still going. Thank you." Thank you Better Braces for a great product that is cost effective and works! I have tried all sorts of inserts and arch supports; none of them works like this does. I used one years ago and all of my plantar fasciitis disappeared. Lately it flared up again and I couldn't find my old brace, so I was thrilled to find they still made this. Then I found the old one, which still works, so now I have one to wear while I wash the other. If the chafing from the rear ankle pad starts to bother me, wearing socks underneath usually works. When I put it on, the pain is better instantly. Wonderful product! I had the most inflamed Plantar that my foot Dr. had ever seen - beat her record. This product in three weeks has brought me down to a much better place and has been very effective and comfortable. Highly recommend it. I have nerve pain of the foot nerves and my ankle is completely numb. This was caused by spinal root damage. The ankle brace with air gave instant relief!! Must order another. Would like to see a product that has an air cushion/compression that covers the entire foot. I've had all sorts of trouble with arch pain for years and I love this product has really helped. It's support is so subtle, but very effective. Better than arch supports for me.